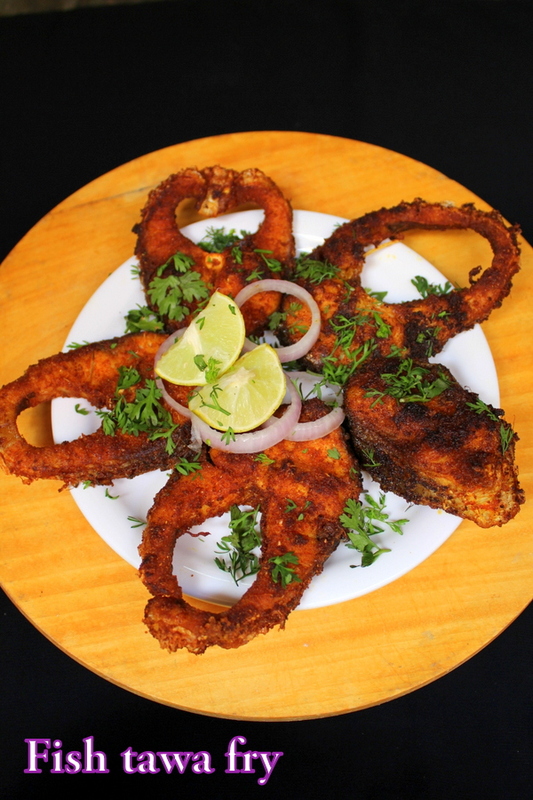 Fish fry masala or masala fish fry is a mouth watering and very tempting fried fish recipe made using fresh fish pieces coming out straight from fresh waters. I have also shared the video for making fish fry masala below. Usually fish is fried in several ways and every way of fish fry is delicious and quite appetizing. Here I have used big fish slices, made a paste using some masalas, coated the fish with the masala and shallow fried them well. 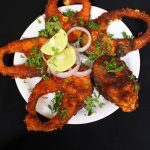 This is the best masala fish fry recipe where we need to marinate the coated masala fish pieces and then shallow fry them until they turn soft and crisp. The main and the most important part in making fish recipes is selection of the fish and if a good fish is selected, then half work is done. The fish has to be alive, fresh, then it has to be cut into desired shapes and sizes. The fish selection plays an important role in fish fry masala as every different fish gives out a different taste. There are varieties of fish found in the market. 2.Cut it into desired shapes and size(not very thick in size). 3.Wash it well under running water several times. 4.Apply salt and turmeric to all the pieces and rest it aside for few minutes. 6.Lemon juice too can be used to wash it well(just apply it for 5 minutes and wash the fish well if smell appears). 7.The fish pieces are ready to be used for frying or to make curry. Here to make fish fry masala, the masala used is common spices that are easily available at home mainly in Indian kitchens. The fish fry masala recipe requires the coated fish to be marinated well for 10-15 minutes so that the masala is well absorbed into the fish during the process of shallow frying. 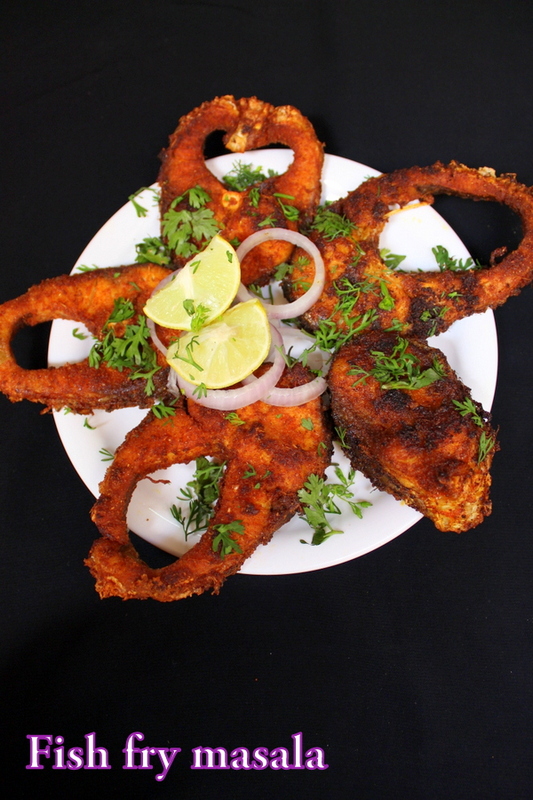 The fish can be fried on a pan or a tawa. 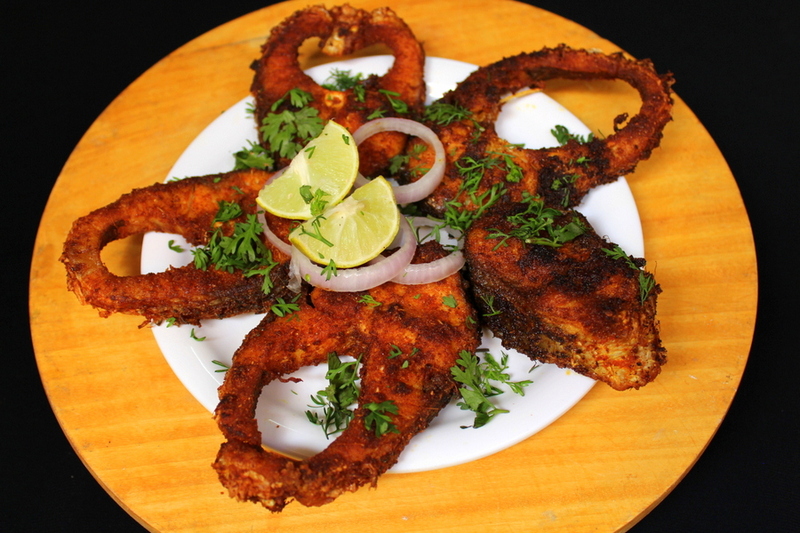 Below is the recipe on how to make masala fish fry which is quick and easy. A quick and easy fish fry masala recipe. Take fish pieces, wash them well under running water, apply some salt and turmeric to the fish pieces and rest it for few minutes. Wash the fish well again and also use lemon juice if there is still any unwanted smell. In a bowl or a plate, add red chilli powder, turmeric powder, cumin seeds powder, dhaniya powder, salt as per taste, ginger garlic paste. Add water gradually approx... about 2 to 3 tsp, mix it and make a thick paste. The masala paste is ready. Take some paste in your hands, take the fish piece and coat it all over the whole fish piece with the masala paste. Coat all the fish pieces with the masala paste. Marinate the fish for 10-15 minutes. In a pan, add 3 tbsp oil and heat it. Place the fish pieces carefully and cook them for 5 minutes. Flip the fish pieces and cook the other side too for 5 minutes. Flip again and cook for 5 minutes on medium flame. Flip the other side too and cook for 5 minutes on medium flame. Each side should be shallow fried well for 10 minutes on low to medium flame. Take the fish pieces out. Place them on an absorbent paper. Similarly, fry the rest of the pieces. Sprinkle lemon juice while serving the fish. Serve with onion rings and fresh coriander leaves. 1.Do not get confused in turning the fish pieces upside down, just make sure to fry both the sides well until fish turns soft, golden red and crisp. 2.To get a perfect fried fish it approximately requires 15 minutes for both the sides to be fried well.